It is about half hour past midnite. But GiLoCatur is not in bed yet. Just watched the World Cup match between England and Germany. Hoped England to win but unfortunately Germany was too good for it. So, GiLoCatur browsed the local Malaysian chess blogs. Below are the updates on this weekend chess tourneys. As far as GiLoCatur concern, there are three chess tourneys during this weekend. All of them are rapid chess. In DAT Chess Center, 87 chess players participated in the Stonemaster Amateur Special Edition Limited (SMASEL). Many familiar faces to GiLoCatur were playing in the tournament only for below 1650 national ratings players like Syed and Sahir of 17ChessClub, Cikgu Suhairi and several MSSM players. Who is the eventual champion? Scoring 6.5/7 points, Mohd Rezal Che Man is the champion. Check out stonemaster.info and Gilachess blogs for the complete result and photo updates. In Kuantan, there is a seven-round G/30 rapid open. 60 and 36 participants were participating in two categories - the Open and Under 12, respectively. Most of them are from Pahang and Terengganu while few players are from KL or Kuala Lumpur like Kamaluddin Yusof aka Abang Bro and Goh Xin Yen, Selangor Under 15 Girls player. GiLoCatur salutes their determination, dedication and passion to play and participate in a chess tournament even though have to travel far. Below are the eventual champions. Abang Bro won the Open section after scoring 6.5/7 points while Siti Aisyah Sabirin from Terengganu won the Under 12 category with the similar score. Check out here (the Open section) and here (the Under 12 section) for the complete results and pairings. As for the photo updates, check out Kelab Catur Setia Kuantan blog. GiLoCatur does not have the info and results for the third chess tourney - the 5th leg (Batang Padang) of Perak Chess Grand Prix held at SMK Slim River. As for GiLoCatur and the kids, no chess during this weekend. We went back home for a wedding ceremony of a close relative. Mungkin ramai peminat2 catur di negara ini yang telah terbaca tentang artikel "Percaturan Dua Beradik" mengenai WFM Najiha dan kakaknya, WCM Nabila dalam akhbar Metro hari ini. Jika anda belum membacanya dan mahu tahu apa yang ditulis mengenai pembabitan mereka dalam sukan catur, sila ke link ini. GiLoCatur berharap lebih banyak artikel sebegini yang mendapat perhatian media-media tempatan kita bagi menggalakkan lebih ramai generasi muda Malaysia berkecimpung dalam sukan catur yang memberi banyak manafaat dan faedah terutamanya sebagai modal insan kepada negara. GiLoCatur would like to wish "Best of Luck" to both of them in putting Malaysia in the world chess map. Make Malaysia proud by earning the highest title in chess, the Grand Master or GM. To' Penghulu (kanan) dengan gaya yang tersendiri. Sewaktu menunggu Fikri dan Anis bertarung dengan lawan masing-masing di Kejohanan Catur NCC di Kolej Pendeta Za'ba UKM Bangi baru-baru ini, GiLoCatur amat tertarik dengan mini blitz tournament yang berlansung di luar dewan pertandingan. GiLoCatur tidak berapa mengenali mereka tetapi permainan mereka amat menarik perhatian dan menghiburkan. Kata-kata bersifat provokasi dan sinis sewaktu menggerakkan buah menjadikan permainan catur mereka very intriguing. Style dan gaya permainan mereka juga agak berbeza dari kebiasaan. Singgah makan malam di cafe ini merupakan satu kenangan pahit bagi Fikri. Kerana beliau telah kehilangan handphone Nokia baru yang merupakan hadiah dari bondanya atas kejayaan mewakili Selangor di Kejohanan Catur MSSM 2010 di Perlis. Bak kata orang Negeri Sembilan, "Apo Nak Dikato! ", "Malang Tak Berbau". Terpaksa terima hakikat, lubang tandas menjadi destinasi handphone tersebut untuk hilang. Kenapa agaknya GiLoCatur memaparkan gambar pondok kayu di atas? Sebenarnya, pondok kayu kecil di atas merupakan "prayer room" di sebuah restoran bernama D Asria Cafe, tempat GiLoCatur sekeluarga menjamu selera "dinner" setelah berakhir pusingan kelapan NCC baru-baru ini. Ia sebenarnya agak istemewa bagi GiLoCatur sebagai satu nostalgia sewaktu zaman kanak2 dahulu di kampung yang boleh dikatakan kesemua surau-surau diperbuat daripada kayu. Having laksa as per the above picture in Kuala Perlis shall be one of the great moments for GiLoCatur for the Perlis vacation. It is very delicious compared to laksa in other places or towns. There are many types of laksa actually. Go to this site to have a look at some of them. So, to those who visit Perlis do not forget to have a taste of laksa Kuala Perlis especially if you are a foreign tourist. The above food is not popular or famous in Perlis. Actually, GiLoCatur had it while stopping at the Juru R & R. It is called Rojak Pasembor, a very popular food in Penang. Interesting, right? Normally, while travelling either in Malaysia or abroad GiLoCatur will take the opportunity to taste the special and popular food in the place or town visited. Even though tired, GiLoCatur is happy to have a vacation with family in Perlis while having chess events to participate especially GiLoCatur's kids. Can You Name The Square? Does anyone know what the above place is? Where it is located? What clock tower is it? So many questions uh? For Segamat folks, surely can name and identify the above square. 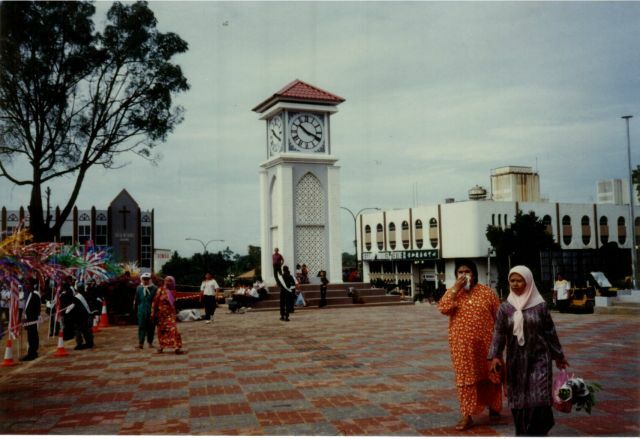 It is the SEGAMAT SQUARE located in Segamat, Johor. Why GiLoCatur displays the picture? It is just the teaser for the Segamat Chess Challenge that will be held on this coming 3rd July. On 4th of July, there will be a chess training programme conducted. So, take the opportunity to participate in a chess tournament and learn from the chess master in one weekend in Segamat. For further details and info, go to http://168chessmaster.blogspot.com/. !!! ARE YOU READY TO RUMBLE IN TELOK GONG ON 4th JULY? !!! 4th July is around the corner. It is less than 2 weeks from today. Have you booked the date for Telok Gong Pro Am Chess Tournament? Are you, the Malaysian chess enthusiasts and players, ready to rumble in Telok Gong? Check here to refresh the info on the tournament. The Hectic Midterm School Break for GiLoCatur Is Over! The hectic two weeks of midterm school break is over for GiLoCatur and many more other chess parents. Why hectic during the school holidays? The answer is because of CHESS. In the first week of the break both Fikri and Anis were participating in the MSSM Chess Championship held in Kangar, Perlis. As to give moral support to them, GiLoCatur and wife had planned to have a vacation there. Both Fikri and Anis went to Perlis on Saturday (5th June) morning with the Selangor chess contingent. They had a one day rest before the championship started in the afternoon of Monday. Fikri was playing in the Under 15 Boys, i.e. B15L, Individual category while his younger sister, Anis, was playing in the Under 12 Girls Team event. It was the first time that Fikri would represent Selangor in MSSM while it was the second time for Anis. Both of them played seven rounds of G/90 games during the five days between 7th and 11th June. Thank the Mighty Allah, both of them were on the podium among the winners. Fikri managed to win the 9th placing while Anis won the silver medal. Anis also won the Best Board award after six wins. Alhamdulillah, GiLoCatur and wife presence there was rewarded. On Saturday 12th June, both Fikri and Anis participated in the Kilang Gula Chess Open. GiLoCatur and Fahim also participated. Anis was playing in the Ladies/Women category. It is quite rare and seldom to have such category in the chess open. While Fikri and his eight-year-old brother, Fahim, played in the Under 18 category, GiLoCatur participated in the Open section. Eventhough Fikri and Anis were tired after the MSSM championship, they kept on playing. They managed to be on the podium receiving their prizes from the Perlis MB or chief minister, Dato' Seri Dr Md Isa Sabu. Having rest days on both Monday (14th June) and Tuesday (15th June), both Fikri and Anis participated in the National Closed Chess Championship. Last year they did not participate because we had a family vacation in Langkawi. The tournament started on 16th June and ended on Sunday, 20th June. They had to play nine rounds of G/90, 90 minutes time control, games. They stayed at the hostel. After they completed their last rounds, GiLoCatur and family rushed back home because we need to send back Fikri to his hostel before 6.00 pm. GiLoCatur believes many have known who are the new Malaysian NM (National Master) and NWM (National Women Master). For those who still don't know, below are their pictures taken from the tournament's official blog - http://nc-2010.blogspot.com/. Syabas and Tahniah to the new champions! Congratulation also to all who took part and made the tournament a successful one - the organiser, the sponsor, the players and the parents. Last night, GiLoCatur's eldest son, Fikri, called while GiLoCatur was having late dinner after just got back from Pendeta Za'ba College in UKM Bangi, the venue of the ongoing Malaysian National Closed Championship. He sounded panic. He asked GiLoCatur to ring Abdul Haq ASAP, the key person of the organizing committee. The reason being was that Cikgu Fuad (blue shirt in above picture), the dedicated father of the Kedahan chess siblings of Fairuz Hamizah and Sirajuddin Munawir, was found fainted while having shower. Fikri said that Cikgu Fuad must had been fainted for a couple of hours. Immediately, GiLoCatur called Syed Iskandar who is also a chess blogger and participant of the tournament. He also stay in the hostel. He told GiLoCatur that Cikgu Fuad was already being carried away to his hostel room. Then, GiLoCatur called Abdul Haq to report about the emergency. Someone had already phoned him and he was on the way to the hostel. GiLoCatur didn't know then what actually happened to Cikgu Fuad. Was it due to blood pressure or heart attack. Later, GiLoCatur found out that Cikgu Fuad suffered a stroke. He was brought to Hospital Serdang. Let's all pray that he will get well and better soon. While most Malaysian chess players are competing in the on-going NCC or National Closed Championship - both Men and Women sections, three Malaysian juniors are participating in the Asian Junior Chess Championship held in India, the country of the world chess champion. The three of them - Evan NM Timothy Capel, WCM Nur Nabila Azman and her younger sister, WFM Nur Najiha, just played in the MSSM last week. GiLoCatur believes by playing in such international tournament, they will improve and have more experience to be on par with their peers around the world. GiLoCatur also hopes that they will perform the best to make Malaysia proud and put it in the world chess map. "SELAMAT BERJUANG!" Go to Hairulov's blog here and here for the updates. The Malaysian National Chess Championship (NCC) started today. The venue of the tournamenr for 2010 edition is at the UKM's Pendeta Za'ba College. The event has two categories - one for the Open (Men) and one for the Women. 92 local male chess players registered for the Men's NCC while only 43 female chess players registered in the Women's NCC. The famous Ng6 (left) faced the top seed, Loo Swee Leong on the first board. The top seed in the Women's section, Alia Anin Azwa (right), one of the NWMs was paired against Nur Farihah Aminuddin from Bukit Jelutong. GiLoCatur's eldest son, Fikri, and his younger sister participate for the first time in the event. By participating in the NCC, both of them would only enjoy two days of the midterm school break. They had been in Perlis for one week for the recently concluded MSSM and now in the NCC. Sometime GiLoCatur feels pity for them for not enjoying their weekends and school holidays. Most of their weekends and school holidays are spent for chess. That's the sacrifice that they have to endure for playing chess. It is about four days that this blog is not updated. Why? The answer is simple. GiLoCatur just got back from a one-week vacation. Tired. Furthermore, need to focus on work. Not fully recover yet from being tired of holidaying (was it really a holiday eh? he he ) in the northern part of the country, GiLoCatur becomes hectic again since both Fikri and Anis participate in the Malaysian National Closed Championship (NCC). The former in the Men's category while Anis in the Women's category. The championship held in Kolej Pendeta Za'ba, UKM just started today and will end on Sunday. What GiLoCatur wants to write first? Let's see the result of the poll about the recently concluded MSSM Chess Championship. The poll is "which state would be the overall champion of the 2010 MSSM Chess Championship?". 127 responded to the poll. One third had responded correctly. GiLoCatur strongly believes that the poll response reflects something. Selangor, Pulau Pinang and Wilayah Persekutuan have shown their prowess in chess. How about other states? Kelantan and Kedah got quite good response. How about the rest? Chess has very little followers and ardent fans in these states. Whatever it is, GiLoCatur hopes interest in chess will grow and increase in Malaysia. The Gula Chess Open Is Ready! On Saturday, 12th June, the Kilang Gula Open will be held at Dewan Warisan, Kangar. Since GiLoCatur and all the kids are in Kangar, all of them will participate in the event. GiLoCatur dropped by at the tournament venue to take a look. 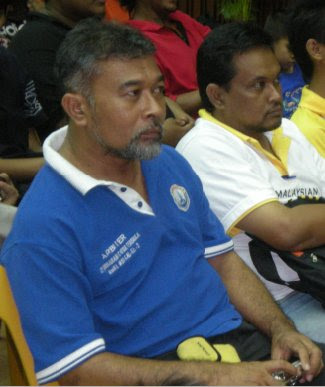 Encik Shaiful (above picture) and Syed Chess were there to make the final preparation. MSSM Chess Championship 2010 edition ends on Friday afternoon after the prize givin and closing ceremony carried out in several stages. The first one was carried out at around 12 noon at the tournament venue. Only the Best Board winners and the 4th to 10th placing winners for every section were given during that stage. 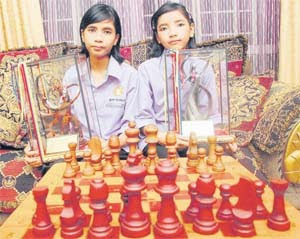 Two GiLoCatur's children were participating in the event held from 7th until 11th June 2010. Therefore, basically GiLoCatur and wife had camped in Kangar and had been at the Putra Palace Hotel during the tournament. Anis (left) with all her team mates. Luckily, both of them would not come back home empty-handed. Fikri (below picture) managed to win the 9th placing in the Under 15 Boys Individual category. For the individual category, the medals are given to the top 10 winners while for the team category, only the top 3 winners will receive them. Besides that, the Best Board are given to the best scorer for each board. Anis Fariha (the above picture) received the Best Board award after 6 wins and 1 defeat. She played the third board. Her team mate, Puteri Munajjah also won the award. She plays the first board. All the Selangor chess players. Current Malaysia's wonder boy, Yeoh Li Tian, is leading the L12 category with halfpoint. Aziz Farhan of Johor managed to draw with him. Harleiff of WP is second while Subramanian from N9 is third. The defending champion, Yeap Eng Chiam, managed to be on the top in L15 section eventhough he drew at one time. He beat Roshan of Selangor who is second in the fifth round. Two Johor players - Ng Shi Hao and Daniel Iskandar are trailing with 4.5/6 points. In the final round, Eng Chiam will play Lim Chuin Khai. The two Johor players will play against Selangor players. Shi Hao will meet Fikri, GiLoCatur's eldest son while Daniel will face Roshan. Nabil of Selangor is the leader for L18 section. Four other players are trailing halfpoint. Who will emerge the champion to take the crown from Lim Zhou Ren? The question will be answered after they complete the final round. Both Selangor P12 players - Nur Najiha and Puteri Rifqah, are the leaders with 5.5/6 points. In the sixth round yesterday afternoon, the former defeated Nithyalakshmi of N9 while the latter beat Tan Li Ting of WP. In the last round, Puteri will play Teh De Zen of PP while Najiha will play Siti Khadijah of Terengganu. In P15, three players are leading the pack with 5/6 points. They are Amira Syahmina of Selangor, Pavitranayagi of WP and Nur Nabila of Selangor. Interestingly, Nabila lost to Pavitranayagi in the fifth round. Meanwhile the latter lost to Amira. Amira, on the other hand, lost to Nabila. Who will be the champion? Let's wait until the final round to know. In P18 category, Alia of Melaka is leading the group. Trailing halfpoint are Olivia of WP and Winnie of Selangor. Can Alia win her final round to claim the gold medal? GiLoCatur will sum up the top rank after the sixth round since the broadband is so slow to upload all the pairing (R6 & R7) and results (R5 & R6) in the JPEG files format. In the final round, PP vs KEL, SEL vs SBH & WP vs TER. Unless Pulau Pinang is defeated by Kelantan, the former will grab the gold medal from the defending champion of Selangor team. In the final round, PP vs MEL, SEL vs JHR & KEL vs WP. It is difficult for the reigning P15 champion Kelantan to win it again this year. Both Selangor and Kelantan may be champion if only Pulau Pinang lost to Melaka. It is a good chance for Sarawak to win a gold medal in this category. What they need to do is just win their final round. Besides Johor and Selangor, there are two other teams with 8 match points - WP and N9. SWK will play PP, JHR will play TER while SEL will play the host team, PER. Four more other states have same point with WP. Pulau Pinang has assured to win this category after scoring full points. Johor will grab the silver medal provided that they win the final round. Johor has the same point with the third rank, WP. But they need to beat Selangor to be on the podium. Wilayah Persekutuan must win against Pahang to assure they are among the medalist winners. Two more other states have same point with Johor - WP & SBH. Perak must win against Melaka to be the champion. PP is matched up against Sabah while Johor is matched up against Wilayah Persekutuan. GiLoCatur wish GOOD LUCK to all the players in the Team category including Anis Fariha, GiLoCatur's daughter who plays in the P12 section. Tomorrow is the important day especially for medal contenders. Four teams have the same MP (Match Points) leading the P12 category. But PP team is on the top due to tie breaks. PP, WP, SEL dan SWK. PP would lead the pack if it won against WP in the fourth round. GiLoCatur expected WP won in the third round against PRK, but other wise happened. In the fifth round this morning, SEL will play WP on Board 1 while SWK will face PP on Board 2. Can SEL beat WP? Can SWK stop the strong PP team? Let's wait and see. SEL and KDH are leading 7 match points afte 3 wins and 1 draw. The above is the schedule for the 2010 MSSM Chess Event held in Kangar in the first week of the second school mid-term break. It was posted on the wall yesterday by the organizer. Some parents have gone back home yesterday while some will come today to give support to their young ones who proudly play and represent for their respective states. Yesterday, after the fourth round ended most state contingents went to Padang Besar for getaway. GiLoCatur along with wife and Fahim, the youngest son, also had visited several places including Padang Besar to have a relaxation and getaway after three gruelling and tiring days. GiLoCatur will write later about the visits. "Where is my name eh! Do not see my name lah ..."
"Wah main chess pun mahu tiru ka?" ... just kidding ma ... jangan ambik hati no! "Opening apa aku nak main ni?" GiLoCatur woke up very early this morning. Why? Actually, GiLoCatur along with wife and the youngest son, Fahim, will drive from Shah Alam to Kangar. Yes, GiLoCatur will be on vacation. But the vacation is to be at the MSSM Chess Championship that will be held from today until Friday. Both Fikri and Anis are representing Selangor in the event. Fikri will play in the U15 Boys Individual category while Anis will play in the U12 Girls Team event. We started the journey. Expected to arrive at the Putra Palace Hotel, the venue of the tournament, at around 12.:30 pm since it takes about 6 hour-drive. After stopped twice for breakfast and lunch, we arrived at the hotel at about 1:00 pm. We had our breakfast at Tapah R & R and had the lunch at a restaurant located along the Alor Star - Kangar road. Waited at the lobby area of the Putra Palace Hotel. The first round was supposed to start at 3:00 pm but posponed for about a half and hour due to some pairing issues. GiLoCatur started to take photos of the players who began to arrive starting from 2:30 pm to the hall where the tournament will take place. GiLoCatur met and greeted several parents and players. Waiting anxiously at the hotel lobby. About an hour later, Fikri came out from the hall showing OK sign meaning that he won. Few minutes later, two of Anis team mates came out telling that they had won. Then a bit later, GiLoCatur was informed that Eja, the U12 Girls first board also won meaning that Anis' team had already won against the Johor team. GiLoCatur became more anxious and walked upstairs to peek to the tournament hall to find out about Anis. A coule of minutes later, Anis walked out the hall carrying her score sheet. Quickly, GiLoCatur asked her what's her game result. GiLoCatur was sighing graciously after being told that she won. What a great start. Tomorrow, two more rounds will be played. Until then, GiLoCatur wants to update the the first round pairings at MSSM2010 blog. Burger King Sparring Is Back!